Addressing a massive public rally at Kullian in R.S. Pura assembly constituency, BJP Member of Parliament & J&K Prabhari Avinash Rai Khanna assured that Narendra Modi will take forward former Prime Minister Atal Behari Vajpayee’s legacy after becoming Prime Minister. “Ours is a party which works on set principles and ideology. It is our party where a common man born in a poor family can become our National President or Prime Minister”, he said. After independence, BJP got an opportunity to form the government at centre for six years and the man who headed this government was a son of common family. This Prime Minister, Atal Behari Vajpayee, worked for the welfare and upliftment of weaker sections, women, youth, ex-servicemen, senior citizens besides bringing revolution in developmental activities, including extension of road, rail and air links to remote and far-flung areas, complete check on price-rise and there was not corruption during his six year tenure. Same Vajpayee took the initiative in bringing separated families in India and Pakistan together by starting bus service and signing cease-fire agreement with Pakistan. Unfortunately, with the change of power at Centre, the Congress shelved all the nation-centric, people-centric and pro-poor programmes, schemes and policies of BJP-led NDA government. Now, once again, the party has announced son of a common and poor family as its Prime Ministerial candidate named Narendra Modi. The people want to see him as next Prime Minister and the party assures that Modi will continue to work on the same line as initiated by Vajpayeeji.Expressing grave concern over the plight of lakhs of refugees from West Pakistan, Khanna said that J&K is the only state where our own people are living with the tag of refugees for the last 65 years. The Congress, which ruled the country for maximum period did not feel it necessary to treat them human beings and grant the rights enjoyed by other citizens. The refugees of other categories too have been discriminated at different levels. He made a categorical promise that Narendra Modi will solve the problems of refugees and create an atmosphere for their honourable and dignified life as citizens of India. BJP candidate from Jammu-Poonch Parliamentary Constituency & State President Jugal Kishore Sharma, in his address, said that the forthcoming elections are very crucial as the voters have to take a very significant decision regarding to whom the reins of country should be handed over, who can sail out the nation from turmoil, who can check price-rise, corruption, unemployment, scams and ensure the survival of a poor person. “The Congress looted the country even more than the British and Mughals besides promoting dynasty rule, compromising on nation’s interests and converting India into a weak nation”. Making an appeal to vote and support BJP, Jugal said that the only hope lies in Narendra Modi if we want that common citizens, including farmers, border people, weaker sections should be in a position to manage food, shelter, cloths etc. and live with dignity, each one of us should defeat Congress and pave way for Modi to be the Prime Minister.This massive public rally was organized by R.S. Pura MLA Prof. Gharu Ram and the proceedings of the rally were conducted by District President Sat Pal Pappy. 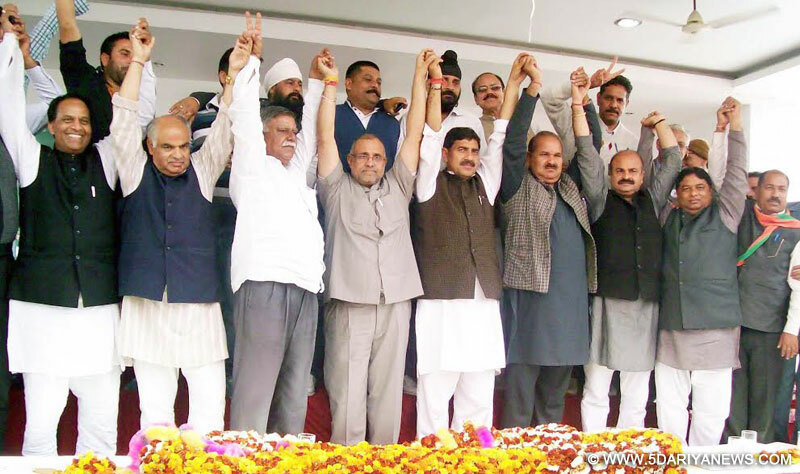 BJP leaders including Ashok Kaul, MLA Prof. Gharu Ram, MLA Sukhnandan Kumar, MLA Sham Choudhary, Bansi Lal Bharti, N.D. Rajwal, Sat Sharma (C.A), Yudhvir Sethi, Sat Pal Pappy, Pt. Ashok Kumar, H.S. Pummy, Karnail Singh, Jasbir Singh Samotra, Barjesh Singh Rana, Inder Sudan, Raj Singh Langeh, Avtar Singh, Rajesh Kumar and Dr. Gagan Bhagat also addressed the rally.Meanwhile, Jugal Kishore Sharma alongwith MLAs—Prof. Gharu, Sham Choudhary and Sukhnandan Kumar and other senior leaders held impressive road shows and addressed corner meetings at Indira Nagar, Brij Nagar, Miran Sahib, Dhindey Kalan, Gazipur Kullian, Kirpind, Khour Deonian, Phinder, Salehar, Rathana, Chak Bala, Chak Bhaktawar, Chohala, Gagian, Khamb, Purana Pind, Kotli Shah Doula and Wards No. 4,6,7,8,9,10,11 of R.S. Pura town and sought vote for BJP.